EnviroDEFENSE® SurfacePRO 10X is a concentrated liquid bacterial cleaner and degreaser for use on any type of hard surface. Its effective cleaning and degreasing power comes from a formula that combines eco-benign surfactants and solvents together with a specially selected bacterial consortium for the deep cleaning of almost any soils and wastes. EnviroDEFENSE® SurfacePRO 10X can be used as a cleaner for surfaces such as restroom floors, toilets, urinals, industrial floors, machinery, tools and general household cleaning. EnviroDEFENSE® SurfacePRO 10X is a powerful cleaner that leaves no streaks and contains a mild orange fragrance. 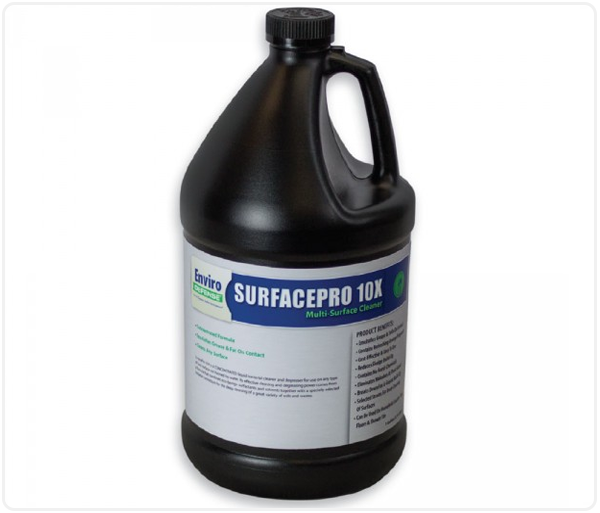 10x formula dilute 9:1, tap water to EnviroDEFENSE® SurfacePRO 10X. Commercial Restroom & Household Application: Mix 16 oz. (473 ml) EnviroDEFENSE® SurfacePRO 10X per 1 gallon (3.78 L) of water for mop or home scrubbing applications. EnviroDEFENSE® SurfacePro 10X may also be used as a pre-treatment. Mix 4 oz. (118 ml) of EnviroDEFENSE® SurfacePRO 10X per 32 oz. (946 ml) of water and pretreat areas for 30-45 seconds prior to cleaning. Liberally Spray Over Affected Area & Let Stand For 30-45 Seconds. Rinse With Water Or Power Wash If Accessible. *For Extremely Heavy Problems A Double Application May Be Necessary. Drain Build-Up Remover Application: EnviroDEFENSE® SurfacePRO 10X is ideal for use as a household or industrial drain build-up remover. Applications may vary but as a standard, apply 2 oz. (29.57 ml) a week for slow running drains. Frequency can be increased daily if necessary.